TEHRAN (FNA)- The Syrian army made major advances in Hama countryside in the Central parts of the country and regained control of strategic towns in there. The army units took control of Al-Jadideh, Al-Malh and Al-Jamileh towns in Mohrad-Salibieh road in Northwestern Hama countryside. Hama province in Central Syria has a population of over 2 million people and it has been the scene of fierce clashes between the Syrian army and militants in the past three years. Also in the past 24 hours, more than 4 notorious Al-Qaeda ringleaders were killed in fierce clashes between the Islamic State of Iraq and Levant (ISIL) and Al-Nusra Front. Meantime, Sami al-Aridi, one of the ringleaders of the terrorist Al-Nusra Front in Syria, raised fraud accusations against Ahmad Jarba, the president of the Syrian Opposition Coalition (SOC), saying he has stolen millions of dollars of international aids. Syrians have held a rally in the city of Homs to thank the country’s military for bringing back security to more areas in the region as well as other parts of the country. Large number of Syrians took to the streets in al-Dahiyeh and al-Ommaliah areas in the city of Homs on Monday, with participation of the city’s governor, Talal Brazi. The government troops have recently conducted successful cleanup operations across the country, inflicting heavy losses on the militants. The Syrian army regained full control over three villages in the western province of Latakia on Monday, following heavy fighting with foreign-backed Takfiri militants. 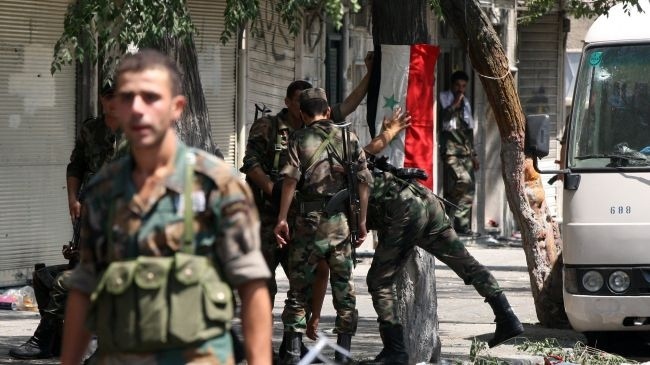 On July 31, the army regained control of the main stronghold of foreign-backed militants in Homs in the Khaldiyeh district after more than one month of fierce fighting. The Syrian Army’s push against the militants has rattled their sponsors. A senior Syrian army commander says the Syrian military forces will clear the northern city of Aleppo from insurgents within 10 days. The military commander, who commands the Syrian army forces in the flashpoint city, said that they have been concentrating their efforts on securing the two key districts of Salah al-Din and Saif al-Dawla. He said that the district of Salah al-Din has been under their partial control since August 9, while fighting was still continuing in Saif al-Dawla. The commander said that once the two districts are under the army’s full control, other areas of the city will easily be cleared of the remaining insurgents. The Syrian army says that 7000 insurgents had infiltrated Aleppo, 2000 of which were killed last month alone.